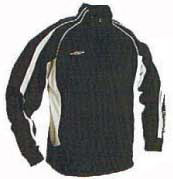 Lightweight polyester knit tricot. Critical mesh venting. 2 zippered packets. Double welt front zippered closure. Rib cuff and waistband. Increased durability and comfort.